Wood felled from the 68-acre property–poplar, pine, oak, hemlock, and maple–was used to build the frame and interior of the two-story, three-bedroom, three-bath shingle-sided home. Portland-born Denis Boudreau was nine years old when he peeked in the backyard studio of his next-door neighbor, artist William Dow. Entranced by the cottage full of magical things—paintings, masks on the wall, even a fireplace—Denis decided at that moment to become an artist—a vow he kept. Dow became his mentor, and 62 years on, Denis is still painting. “I started at nine and I’ll still be going at 99,” he declares. “A ponytail,” Denis remembers, smiling. They were married to other people, but when those unions ended and their paths crossed again, at the Seaman’s Chapel—a hippie joint that served carrot juice, no liquor—their relationship stuck. In 1984, Sarah and Denis married. Denis considered Jon Legere, an accomplished artist and a fellow biker, his second mentor. He recalls how they would load canvases and paints on the backs of their choppers and head out “for a run.” The two often rode to Cape Elizabeth and painted landscapes, en plein air, like latter-day impressionists, Easy Rider-meets-Claude Monet. 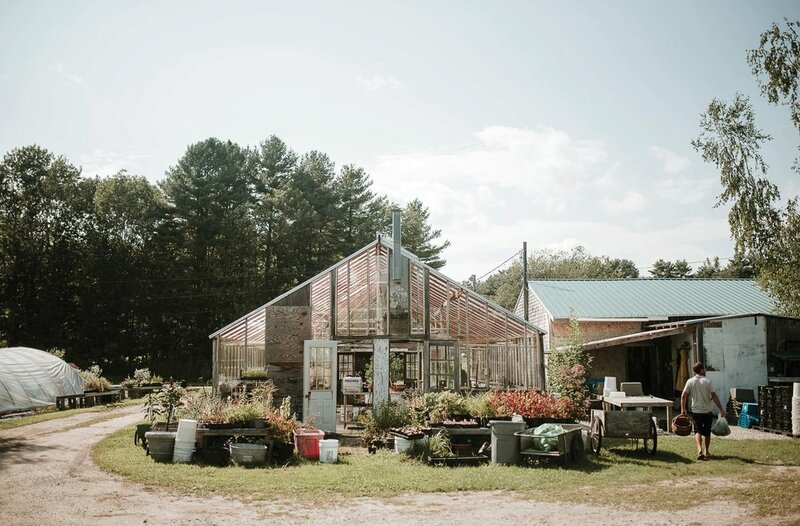 Max Boudreau oversees all vegetable-growing on Winslow Farm, and he and his partner Krysten Powell manage the CSA shares. Here, Max carries some of the day’s harvest beside one of the many greenhouses. They were members of the infamous Iron Horsemen, a club, not a gang, Denis insists and reveals that their motto, “Live free or die,” was inspired by a New Hampshire license plate. It took on another meaning when he was drafted to Vietnam. He served from 1967 to ’68 and sustained injuries from a landmine explosion that damaged and would ultimately claim his sight. 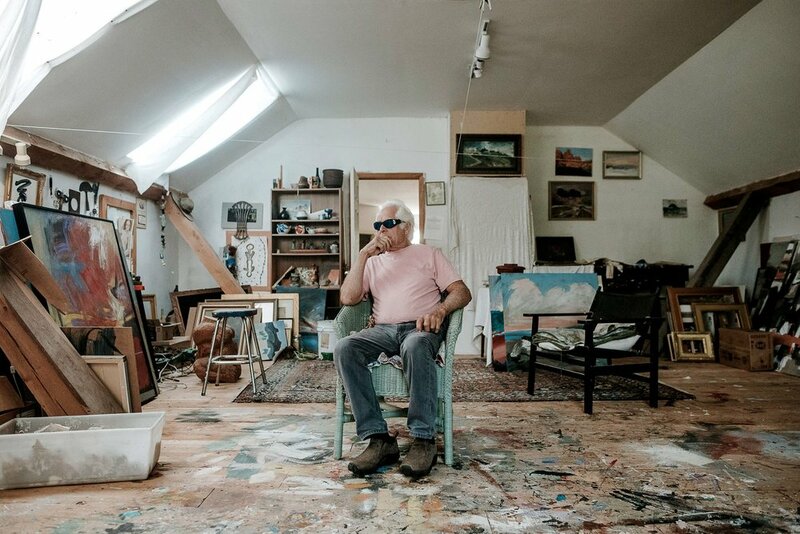 The wide-planked floor of Denis’s studio is a melange of paint smears, splashes, and dribbles, a kaleidoscope mishmash of color that looks like a work of art itself. Denis reckons around 32 artists colonized the neighborhood, turning unheated lofts into beautiful havens. After a long day of painting, they caroused at the Old Port Tavern. To create a venue for their work, they launched the Old Port Festival in 1973, which still runs today. Denis founded Alchem Co., a construction business, and renovated over 20 historic buildings in the West and East Ends. Sons Max and Ben were born in 1985 and 1990, respectively. Sarah and Denis bought Winslow Farm in West Falmouth in 1992 and built the barn four years later. Today, the family farm is thriving, selling organic vegetables and flowers. Sarah runs the farm stand, and Max and his partner, Krysten, oversee vegetable growing. Ben covers the mechanical and irrigation systems. In midsummer, they open a pick-your-own highbush blueberry field. They have several employees and many volunteers. Even Max’s daughter, 1½-year-old Sabine, helps weed the berry bushes when she’s not sampling the crop. 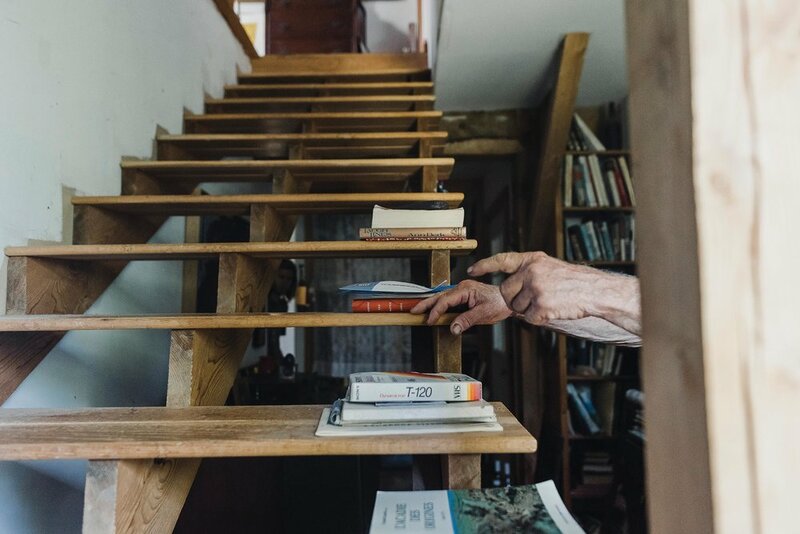 The stairs leading to Denis’s attic-level art studio. On a studio visit, Denis ushers me upstairs. Along the stairwell of the attic-level room are woodcut prints of samurai. The open-slat stairs creak as we walk up, and he jokes that, like a warrior sleeping with one eye open, he is alerted to incoming visitors by the noisy treads. The large skylit room is hung with paintings, tribal masks, kachina dolls, wooden sculptures, and all manner of intriguing ephemera. Overhead, lengths of white string intersect at the room’s center; Denis follows them to orient himself. Stacked against the walls are completed canvases, while the shelves brim with found art. Looking around, I feel some of the wonder Denis must have felt peering into his neighbor’s studio. As I depart, freshly harvested carrots, vivid orange and deep purple, are being sorted. At the farm stand, I select bright-yellow cherry tomatoes and a plump eggplant that looks hand-painted, violet and white. All around there is color and bounty—just like Denis’s paintings. Here, too, the walls display a large abstract by William Manning and two of Denis’s own. This commingling of art and produce feels wonderfully right. Nowadays, Denis’s wild rides may be behind him, and a day of painting may be followed by weeding rather than an Old Port bacchanal, but to me it looks like the perfect arc—some might even say a full circle—made in one masterly, steady stroke. Denis uses string stretched across the length of his studio to guide and orient himself. The studio is lined with his completed paintings as well as Denis’s found-art sculptures and other inspiring keepsakes he has gathered over the years.